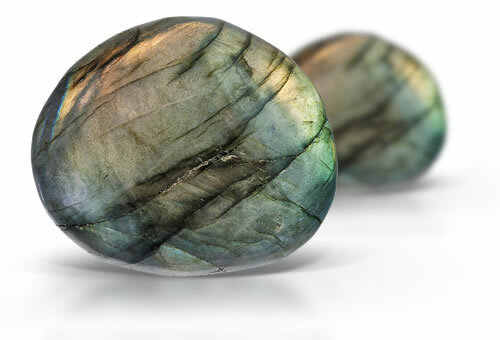 Displaying brilliant pastels and deep golden colors, labradorite features a spellbinding "black rainbow" of color. When appreciating the iridescent play of colors known as labradorescence, observe the strength and intensity by viewing from different angles, as different colors or even a range of colors may be visible from different positions. Stones might show repeated twinning, black magnetite needle like inclusions, ilmenite, and metallic platelets that might be hematite. Oregon material will contain tiny orangy yellow copper platelets.